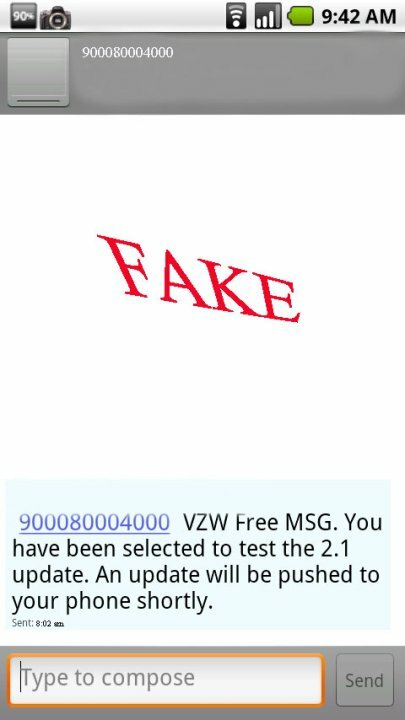 I’m assuming that you all remember the post last night which included a screenshot of a text message from Verizon to a Droid user informing him that the 2.1 update would be arriving on his phone? Well, it took about 2 minutes of analysis on the screen shot he had taken to realize how fake it was and some of you even got in the mix by poking fun at it. And then you all realized that we linked to the original picture which happened to be posted at his Facebook page…bad news for him. 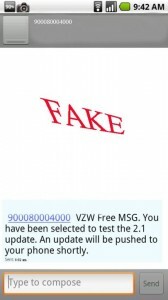 We just received an email from the guy with an update screenie showing “FAKE” pasted across it. He also wanted to make sure to apologize to everyone for running off a joke that got “way out of hand.” And the best part, you guys all bombarded him with over 3,000 emails forcing him to give in! Seriously, nice work Droid Lifers. So please refrain from attacking the guy or sending him anymore messages. He has officially given in to the power of our readers. I know this is a completely random post, but it brought a huge smile to my face this morning and I just had to share. Oh, plus we gained another reader out of it! Thanks again to all of you who continue to make this, what we think is, the best Droid site around. Yer awesome!